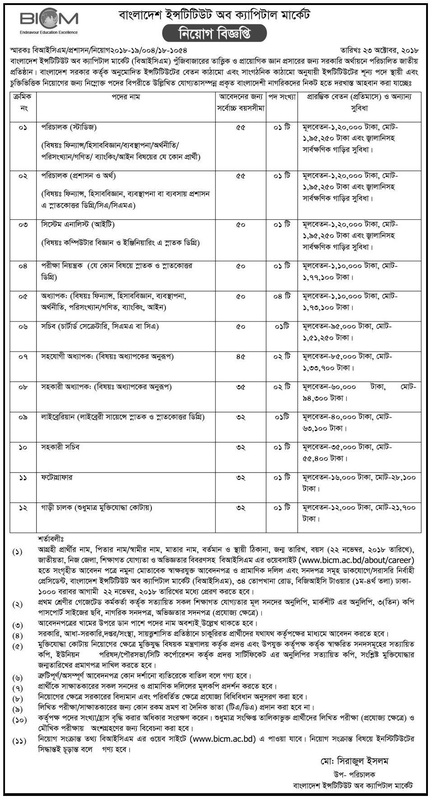 The Bangladesh Institute of Capital Market (BICM) has declared permanent and contractual recruitment notice. BICM will recruit 17 people in 12 posts. Both women and men can apply in the post. You can also apply if you have interests and qualifications. Interested candidates can apply till 22 November. Full notification details were given. Bangladesh Institute of Capital Market started in 2005. It is a public and private partnership firm owned by the government. Here are various types of courses related to the stock market. Educational qualification: Finance / Accounting Science / Management / Economics / Statistics / Mathematics / Banking / Bachelor’s or Master’s Degree in Law. Educational Qualification: CA / CAM / Post-Graduate Degree in Finance / Accounting Science / Management / Business Administration. Educational Qualification: Graduation or Post-Graduate Degree. Educational Qualification: Bachelor’s or Masters Degree in Library Science. Application deadline: 22 November 2018.